Coarse woody debris (CWD) is an important substrate in forests, provides habitat for a multitude of organisms and is also a sink and a source for nutrients and carbon. To assess the dynamics of this substrate equations to describe the course of decomposition have been developed. They can also be used to describe the release of carbon from dead wood into the atmosphere. Unfortunately few equations have been parameterised for European conditions, although there is a need to estimate the dynamics of CWD in this region. Therefore, a method (termed the LB-method) was invented to estimate suitable decomposition rate constants (DRC) from sources published in the CWD Global Database by systematically comparing features and conditions of the area and species of interest with the information given with the published equations. The DRC were weighed according to these comparisons and then sorted by the weight assigned to them. From the resulting distribution a plausible DRC for the region and species of interest was estimated. 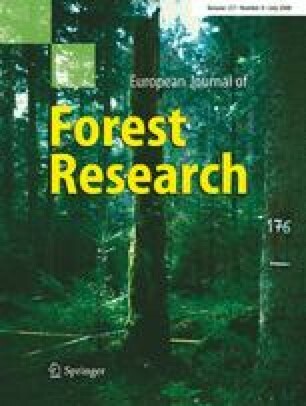 The LB-method was compared to results from a study on Norway spruce (Picea abies L.) decomposition in Thuringia, Germany, and to results from an expert elicitation on DRC for Scots pine (Pinus sylvestris L.) in the Federal State of Brandenburg, Germany. In both cases the method gave results within the confidence interval of the respective study used for comparison. Both methods are suitable for the estimation of preliminary DRC until more accurate constants can be derived by research. While the focus in this study was on density loss the method can be applied to other dead wood features (e.g. volume), and should be applicable to other regions of the world where information is also scarce. The authors thank the experts that took part in the survey. Two anonymous reviewers helped to improve the quality of this paper. This work was partly funded by the European Commission Program Environment and Sustainable Development through the CarboInvent project (Contract number: EVK2-2002-00157).